Ice Storm is an epic Intelligence action card. It is part of the Core Set. In addition to the card's availability in the Core Set, one copy is included in the Ancano's Cunning theme deck, and one copy in the Telvanni Ambition theme deck. 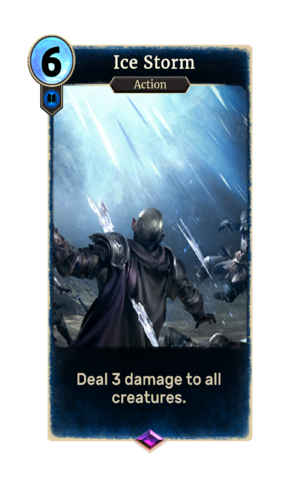 The card is named for the Ice Storm spell, which first appeared in Skyrim. The card formerly used the art that is now found on Winter's Grasp.